More stable and safer than standard walker models. The U-Step Walker is ideal for patients with multiple sclerosis, Parkinson's disease, cerebral ataxia, muscular dystrophy, ALS, stroke and head trauma. The innovative braking system is easy to use and puts you in complete control. The U-Step will not roll until you lightly squeeze either hand brake. Once you release the hand brake, the unit will stop immediately. This feature is particularly helpful when standing up from a chair because the unit will not roll away from you. 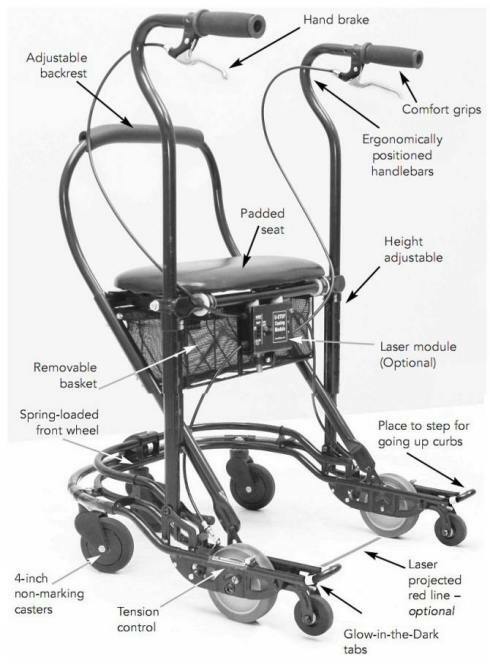 Unlike other rolling walkers, you can adjust the rolling speed of the U-Step II. Many people find wheeled walkers roll too fast for them. That is why the U-Step is engineered with a control for setting the rolling resistance. Loosen the set screw and rotate the adjustment lever to the desired amount of resistance, then re-tighten the set screw. Folding the U-Step II is as easy as one, two, three! Lift the release lever by the seat, pull up on the seat support to fold the U-Step II and put it in the car; no bending down to pick it up. The U-Step II is four pounds lighter than the original UStep, making it easier to lift and transport. Click here to see the U-Step Walker on our website or call 866-722-4581 for more information.